The idea to build a monument scale, multi-millennial, all mechanical clock as an icon to long-term thinking came from computer scientist Danny Hillis and was published in the form of an email to friends. Later it was followed up with an essay published in the 01995 Wired magazine "Scenarios" issue. Danny reasoned that by actually building a remote monument, the discussions around long-term thinking would be far more focused and it would lend itself to good storytelling and myth -- two key requirements of anything lasting a long time. In 01996, a group of these friends led by Stewart Brand incorporated a non-profit around the idea of long-term thinking and responsibility. This group became the founding board of The Long Now Foundation. One of the members, Peter Schwartz, suggested that 10,000 years be the time frame, as it was about how long humans have had a stable climate and technological progression. 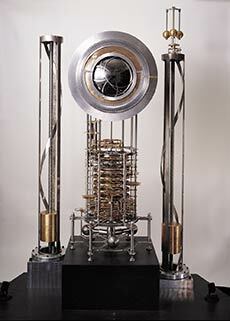 In 01997, the Foundation held a design meeting around the 10,000 Year Clock idea where Danny presented his prototype of a binary mechanical computer. It was at this meeting the Foundation got its name from Brian Eno, and its first employee Alexander Rose. With a sponsor for the first prototype and a new project manager, Danny Hillis began to design the first prototype of the 10,000 Year Clock. The first prototype was completed in 01999 on New Year's Eve where it bonged very slowly...twice. This prototype is now at the Science Museum in London in the Making of the Modern World exhibit. The next project undertaken was an orrery (a planet tracking display) using the same mechanical computer. This project is complete as of the summer of 2005. The Foundation is now looking to scale up the designs with lessons learned from these first two efforts into a monument-sized version. We now have a high desert mountain property in west Texas for the site of the 10,000 Year Clock. We are currently designing this experience and the mechanisms that would be used in this large-scale version. There is no projected completion date, as it is an ongoing program. California Surveying & Drafting Supply, Inc.